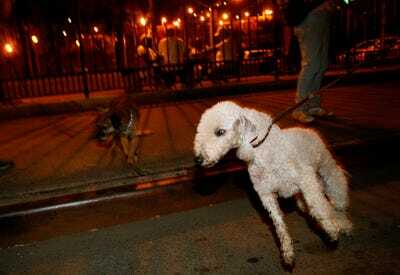 REUTERS/Mike SegarCatcher (L), a Bedlington Terrier, and Tanner (R), a Border Terrier, hunt for rats in a small park on New York City’s Lower East Side July 25, 2014. New York’s rats are nasty, and there are about two million of the furry, disease-carrying creatures roaming the streets and alleys of the city. If you call the city about a rat problem, they will give you tips on keeping them out and tell you how to find a pest control company to poison the rodents. But there are others out there who hunt New York’s vermin, and they don’t do it for pay — they do it because it’s in their nature (and because their owners want to let working terriers “do what they do best”). 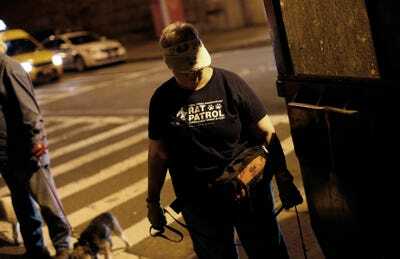 The rat hunters of New York are known as the Ryders Alley Trencher Fed Society (R.A.T.S.). 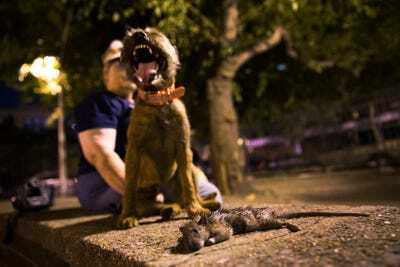 They train dogs to hunt rats and will take the canines anywhere requested to, as they say, eRATicate the pests, provided the location is safe for the dogs, away from traffic, and relatively pedestrian-free. R.A.T.S. has been around since 1995. 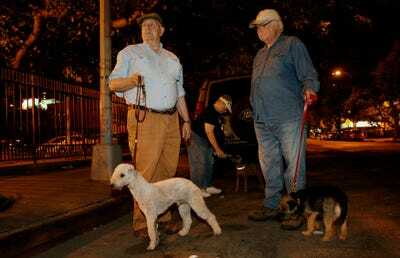 The name combines a reference to the notoriously rat-infested Ryder Alley in Manhattan with “trencher fed,” a term that refers to hunting hounds that live with their owners and go out on group hunts. The most common dog breeds used by the group are border terriers, Norfolk terriers, fox terriers and dachshunds, all historical rat catchers. When weather allows, the rat hunters go out as often as once a week. We’ve compiled some photos here from one July expedition with information from Mitch Moxley of Roads and Kingdoms, who spent a night with R.A.T.S. last year. 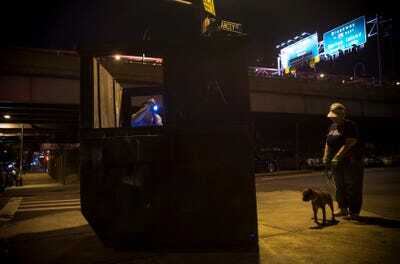 On the night of July 25, a man named Bill walks by dumpsters in a vacant lot near Delancey Street on Manhattan's Lower East Side. 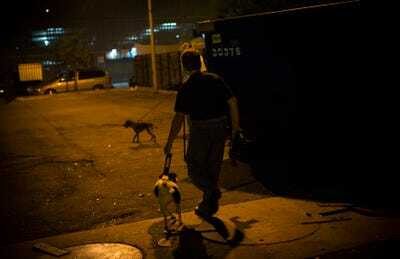 He's headed to an alley -- a preferred hunting location -- with his dog Paco, a Feist Terrier. 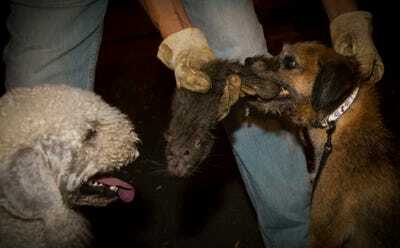 Small dogs flush out the rats, while larger dogs cut off the rodents' escapes. Bill and Paco aren't alone. They join up with Richard Reynolds, a founding member of the R.A.T.S., along with Judy and her Border Terrier Merlin. 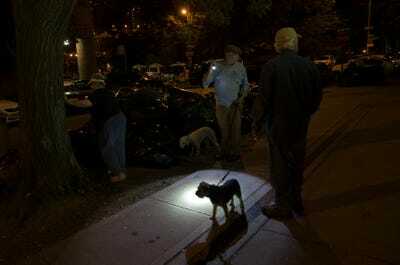 Richard is using a flashlight to look for rats in one of the dumpsters, while Judy and Merlin stand ready if any rats are flushed out. After Reynolds' search with the flashlight comes up empty, Merlin gets knee deep in the dumpster himself. The dogs are obviously enjoying themselves on the rat hunt. The R.A.T.S. says that no dogs have been hurt since hunts started, aside from the occasional small scratch or bite on the nose -- even though the most common rats they encounter are Norway Rats, which can weigh up to a pound. Marlin and the other four dogs on this hunt are all certified Earthdogs by the American Kennel Society. These Earthdogs have to pass tests to show that they have got the drive to hunt. They're trained to jump into hunting mode when near rats, and they're trained to track and bark at their quarry. And yes, they have got the drive to kill, too. And kill they do. When the rats are flushed from the dumpster and caught, the dogs kill them with a bite and a furious shake, then carry the prize to their owners. The dogs, like Merlin here, aren't always ready to let their prizes go, but the hunt is more exciting than the dead rat. Merlin is one of the group's top hunters. In a hunt, a group of dogs might catch anywhere from a couple rats to a few dozen in a night. A quick one, Merlin catches a few on this quiet night. The R.A.T.S. 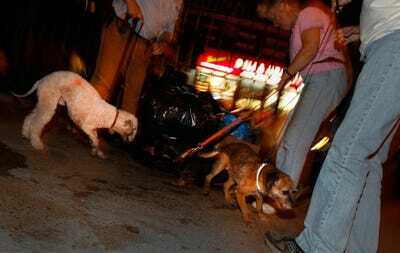 have a few favourite sites in Lower Manhattan to bring their dogs rat hunting, including Theatre Alley and the Fulton Fish Market. Terriers, Dachshunds, and other small dogs have been bred for these hunts for centuries. Group members say that once the hunter instinct 'clicks on' for the first time in a dog, it never turns off. Reynolds' dog Catcher, for example, is a Bedlington Terrier. He gets very excited for the hunt, pulling on his leash, raring to go. Owners say these moments are the happiest in the dogs' lives. Catcher and Tanner, a Border Terrier, try to chase some vermin from the garbage. In the city, garbage sometimes sits out for days, which creates a real bonanza for rats. Since rats are a big problem in NYC, the city seems to let the hunts go on without much interference -- though groups like PETA aren't fans. Still, R.A.T.S. members point out that when a dog kills a rat, it's over in a second -- a glue trap might take days. It's hard to make a dent in the city's rat population. The dogs don't catch enough rats to be a major part of city pest control. But rats are hard to get rid of -- they can smell poison at one part-per-million and easily avoid it. And the dogs sure seem to love the chase. 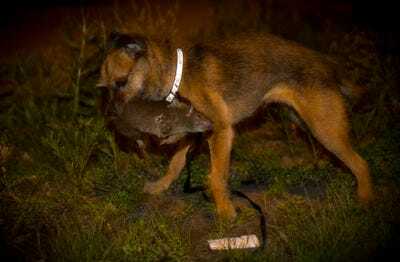 Tanner, a Border Terrier, kills a rat. They haven't had any problems with dogs catching diseases, though certain bacterial infections are possible, according to a veterinarian who hunts with the group sometimes. A dog accidentally getting a dose of rat poison after biting a contaminated rat would be a much scarier possibility. R.A.T.S. will respond to anyone who has a rat problem, though many locations are too out in the open to be safe for the dogs, due to car traffic or too many people walking around. 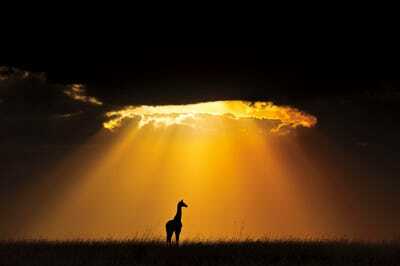 Now see more nature in the wild.